Last time I checked out the “Good Guys” of this set, Duke and Ripcord. Facing off against them are a NeoViper and Neo Viper Officer. 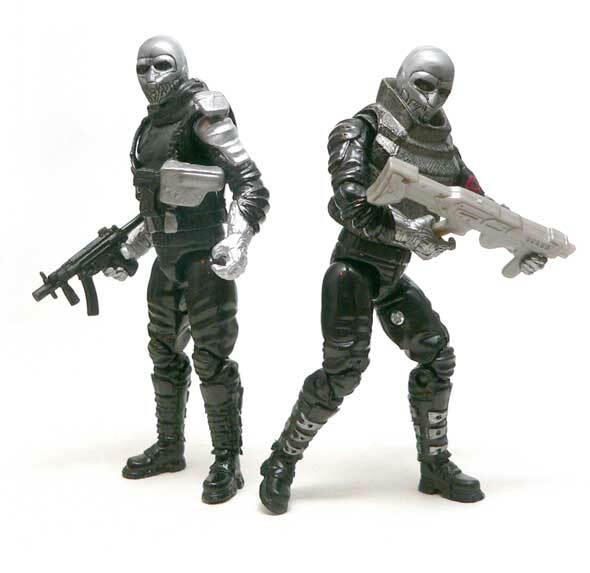 And they are the subject of this weeks, GI Joe review. 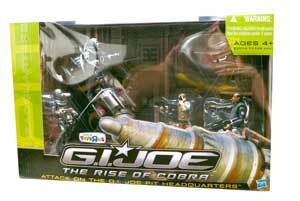 Probably one of the harder things for me to accept in GI Joe: Rise of Cobra were the Vipers. Not that they were there. I can accept Cobra as mutating people into super soldiers. I just had a hard time accepting them as rank and file Cobra Troopers. 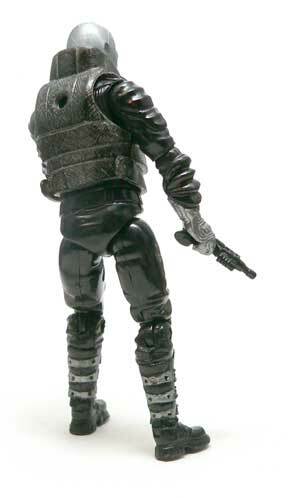 More of a general foot soldier, the Neo-Viper gets a fair amount of armor. 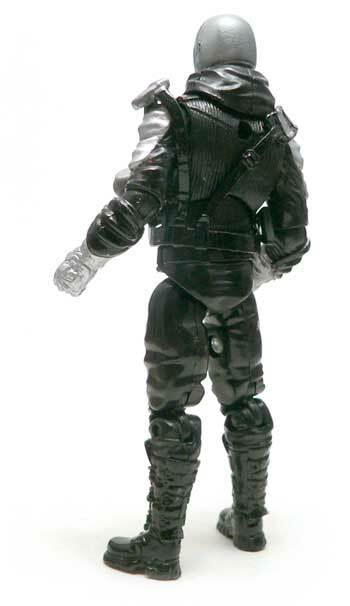 I’m sure this figure is a repaint or just straight up repack of the single carded N.V. I might as well start with the head, which is the part of this character design I’m the least happy with. I can understand the armor and padding. I don’t get how the head plays into any sort of combat soldier role. The full head mask would be hot and the eyes would have limited vision. I really expected the Cobra troops in this film to be more like the MARS Troopers that got very minimal screen time. Not only does the Viper helmet look silly, I can’t imagine it offers any combat advantage. The main bulk of his torso is covered by an over piece of armor. The neck is even protected by it. I have to wonder though if the protection it offers is worth the bulk of it. I do love the metallic finish on it. It’s something that I think the Hasbro team really got right for the most part in this line. Speaking of paint, this NeoViper has Cobra insignia on his left arm. I believe at this point in the film they are not know as Cobra. Actually, I’m not sure they are called Cobra anywhere in the film. The remainder of the body is fairly generic. There’s padding everywhere. If anything he looks ready to skate. Knee pads, shoulder pads, and armored gloves. The look is finished off with some buckled up boots. Now, I don’t know what it is about this set, but I struggle to get this guy to stand. I never did get him to stand up long enough with his back pack on to get a picture. I have to says this next part makes a bit of sense. Well, more sense than every Cobra Trooper having a unique uniform. 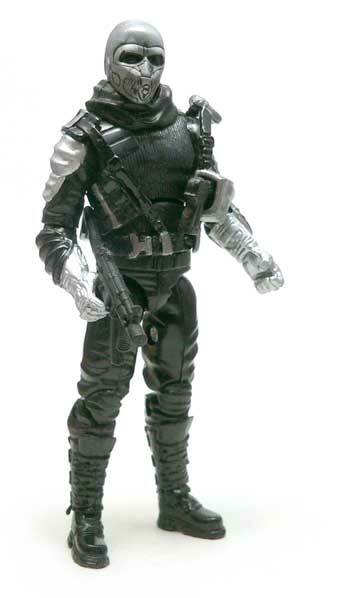 Except for the the chest piece, this is the same exact figure as the Neo-Viper with different paint. And the paint here isn’t nearly as nice the Neo-Viper. Actually, it took me a bit to figure out, but I finally realized what this figure’s paint job reminds me of. Paul Stanley from Kiss. The oversize bright silver shoulder pads and gloves just remind me of that 70’s look. If the boots had been silver it would have been even more so. Instead of armor, the officer gets web gear. Which would have been fine, except for the addition of a giant oversize working holster. I appreciate a good working holster, but one that interferes with the figures left arm and looks ridiculous should be left off. Again, the head and body of this figure are the same. The only other real difference is the neck scarf on this figure, which I found covers up an odd elongated neck peg needed for the armored version. 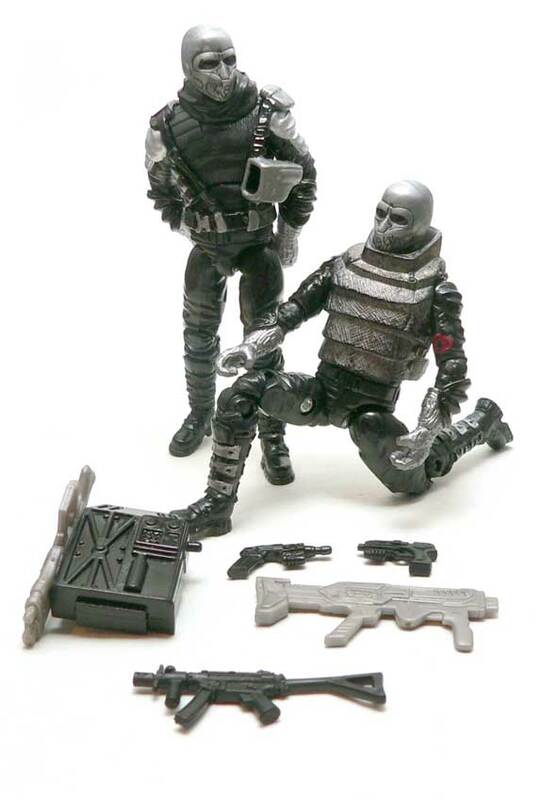 For a force attacking a GI Joe base, these guys come with what you’d expect, lot of armament. The Neo-Viper comes decked out the best with a pack, two rifles and a pistol. Oddly, he doesn’t have a holster for his pistol. 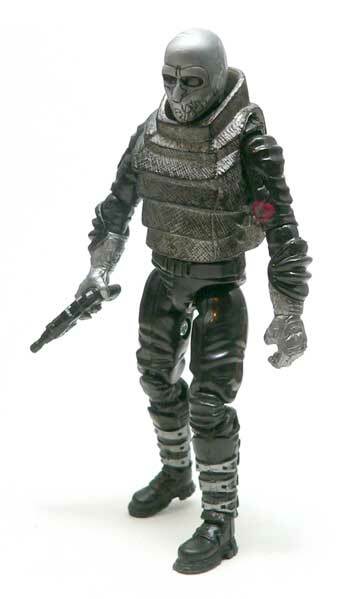 The hand gun is one of those Cobra Ray Gun pistols we’ve seen before with figures like Baroness. The rifles are not really my favorite pieces with this set. They are molded in silver which is kind of hit or miss for me. There are two of them, and they aren’t identical. Why a trooper would need two different rifles of that size, I’m not sure. The back pack is pretty bulky. It looks more or less like a huge box. Again this doesn’t seem like modern combat gear to me. I mean what practical purpose could something like that server? Maybe it’s a mini bar for the officers. The officer comes with a more practical assault machine gun and pistol. Both were used with various figures in the line. I didn’t really didn’t buy this set for the Cobra figures. Yes, I did want the mole pod, but not necessarily the Vipers. It’s not that they aren’t screen accurate, I’m just not a fan of their design. And considering the fact, that most of the Cobra movie troopers are based on this one design these are more than enough for my collection. Yes, they will fill out the Cobra ranks on my shelves, but will be relegated to the background. I much prefer something more practical and realistic like the previously reviewed Elite Viper. Yeah, I never really got into the Neo Viper design either. Thus far I’ve not gotten any r&f cobra from the movie, even though I have seen them heavily discounted from several local vendors. These two remind me of why I stopped collecting Joes in the late 80’s, although I think they could be useful for customizing.